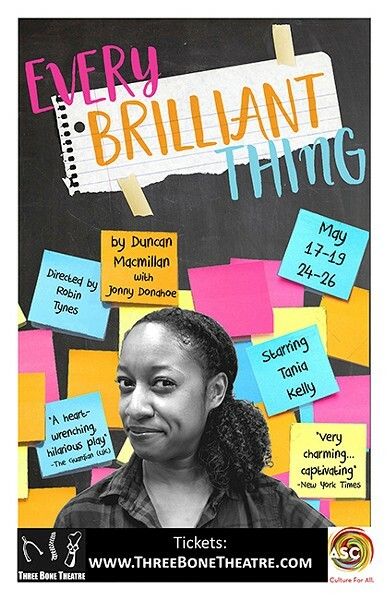 Written by two Brits, Duncan Macmillan with Jonny Donahoe, Every Brilliant Thing began life in 2013 in a little English town and didn't achieve any kind of renown until Donahoe brought the one-man show across the pond in an off-Broadway production the following year. An HBO movie in 2016, a coveted engagement at Spoleto Festival USA last season, and numerous productions across the country have spread the word. To an uncommon degree, this one-man show relies on audience participation to tell the story. When a vet comes by to put down the young narrator's dog, Sherlock Bones, a person from the audience is picked to play the vet. When Mum is taken "to hospital," an audience member helps deliver the scene where Dad explains that the boy's mother has made her first suicide attempt. And when the boy draws up his list of "everything brilliant in the world. Everything worth living for," in a lifelong effort to cheer Mum up and keep her alive, audience members who are given hand-written scraps of paper before the show call out items on the epic list: #1, ice cream, #2, water fights, and so on. But Every Brilliant Thing doesn't have to be a one-man show. Or British. At Spirit Square, where the Three Bone Theatre production opens next week, it won't be. 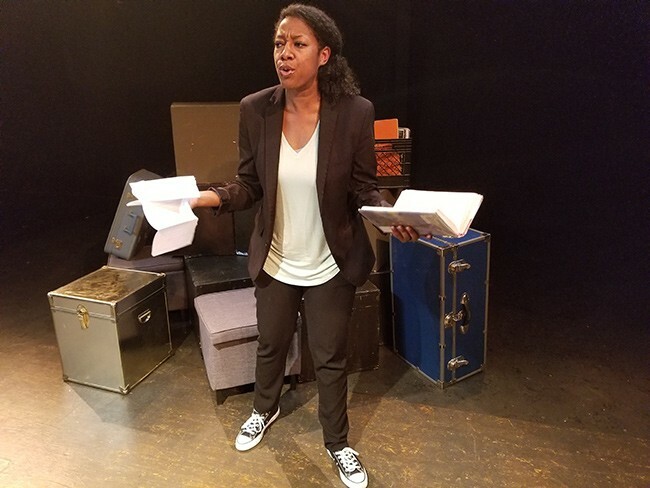 "One of the exciting things about the script is that the playwright has specified that this story can be told by any actor, any gender identity, any race, any age," says Three Bone artistic director Robin Tynes. Rehearsals started back in December. There were no auditions. With so much emceeing, audience interaction, and stand-up comedy skill required, your garden-variety audition wouldn't help a director to make her choice. Tynes just handed the script to Tania Kelly. Tynes needed someone who could draw an audience to Duke Energy Theater, somebody with proven improv chops. "Tania was an obvious choice to me. She has extensive emcee experience, comedy experience through Robot Johnson and other shows, and people love watching her on stage. We worked with Tania in our production of Five Women Wearing the Same Dress, so I knew she had the dramatic chops for the piece. I think she's an excellent actress who often times gets pigeonholed into solely comedic roles." Kelly offers a slightly different account of getting the script from Tynes. "I read it," she recalls, "and then immediately sent her a message that said, 'What do I need to do to be in this??' We had a meeting and then I got to do the best thing ever. I wanted to do this show so bad because I immediately related to the story. But then on top of that, the writer also gave a lot of freedom in the casting of the narrator with all those really interesting footnotes. So, I don't think anything super drastic needed to be changed." Recently named the recipient of A Seat at the Table's inaugural "She Is Dope" Award, Kelly is best known for how smart, brainy, snarky, and caustic her performances have been. She was the worst psychiatrist ever in Beyond Therapy in 2011 and a prodigiously misinformed humanities professor last year in Women Playing Hamlet. But Kelly's dopiest exploit remains her stint as both Dromios in the 2016 Chickspeare presentation of The Comedy of Errors. Tynes plans to give Kelly a more intimate and clubby atmosphere to work in at Duke Energy Theater, reducing seating capacity to around 100 people and putting her star to work before the action begins, working and engaging the crowd. Kelly agrees that her unique résumé has been invaluable. "Robot Johnson has definitely been a master class in 'Just roll with it, trust your friends, and man these drunks are loud,'" Kelly quips. "Also I was a DJ/emcee for tweens for Radio Disney for like five years, and I feel like that skill has really helped lately. But also yes, this is still, for real, absolutely terrifying." With all the unpredictable audience participation that Kelly is called upon to cope with, the rehearsal process had to be re-engineered. It wasn't altogether private, one-on-one, or hush-hush. 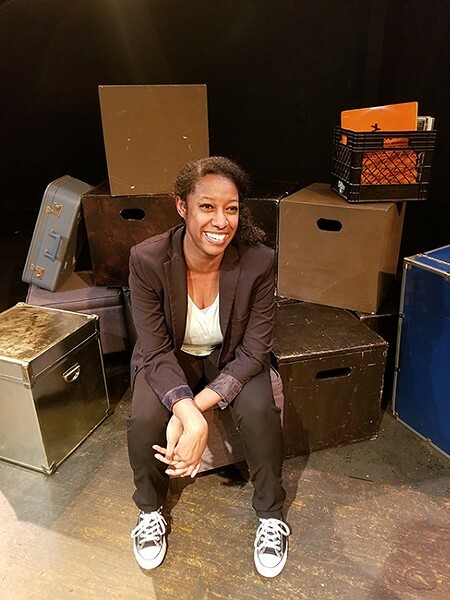 "Danielle Melendez, our stage manager, and Robin have worked really hard to organize a series of test audiences for me to interact with for just those scenes. Which has made this such a fun and unique process for all of us. We've been essentially running a series of experiments. It's been pretty cool." Kelly doesn't mention that a recent performance at Catawba College earned her a standing ovation, but Tynes does. There's still some polishing going on behind the scenes as opening night approaches. Yet the object has never been to make the Three Bone version anything like the off-Broadway production that won Every Brilliant Thing its acclaim. Tynes has devoutly avoided watching any other version of the show, including the HBO special. "It was also thrilling for us," says Tynes, "to interpret and mold this script that was crafted by a white British man to fit an African-American woman. While casting Tania was not intentionally political — she was hands-down the best person for the job — it has inherently changed how I view the script. We're discussing and diving into mental health, and the demographic in the United States with the least access to mental health care is women of color. I love that by having Tania play this role, a woman of color is at the forefront of this discussion about mental health care and support systems." Davidson's pudgy cuddliness will vanish when Kelly takes over his role, but the heavy moments — and the touchy-feely ones — will be part of the challenge that she's embracing. Kelly dismisses any talk of the larger significance of the event. "This is a really funny show about depression," she insists. "I'm just telling a really gorgeously written story." Fair warning: you might feel otherwise. With all its shtick and spontaneity, Every Brilliant Thing becomes something of a ritual when different audience voices chime in, a ritual of empathy, celebration, and healing. "Actually, we are all telling this story together," Kelly agrees. "The audience is creating this with me every night. I have never done anything like this before. I can't wait for y'all to see it!" Oh, and don't be surprised if Sherlock Bones is renamed Chuck Barkley. He's Kelly's dog now, and it's Kelly's show.